One of the world’s rarest and most elusive snakes has been spotted in Guapiruvu, Brazil by two farmers. The men recognized the rare Cropan’s boa on a dirt road and contacted researchers who have been waiting for this moment for 64 years. The Cropan’s boa, or Corallus cropanii, was first spotted in 1953 in Miracatu, and hasn’t been found alive in its natural habitat since. Weighing 1.5 kilos and measuring 1.7 meters (5.5 feet), the female is longer than its Miracatu predecessor, a male measuring about 1 meter. 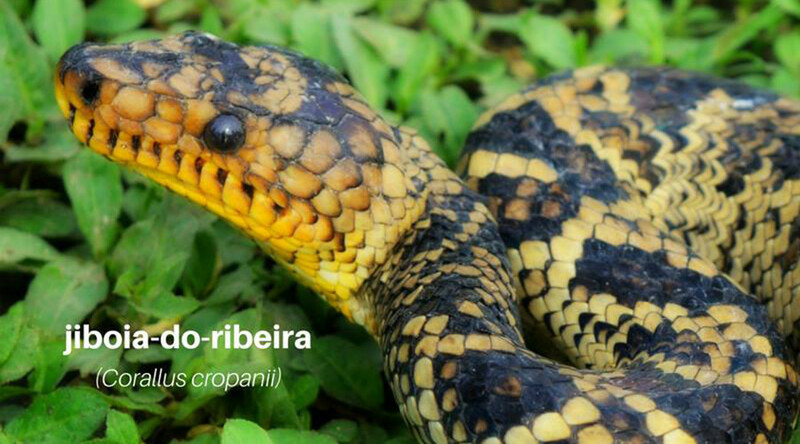 The find was made possible thanks to the Sete Barras community, who were informed about the rare snake by biologists Bruno Rocha and Daniela Gennari from the USP Zoology Museum and Livia Correa from the Butantan Institute, according to Carta de Noticias. Starting last October, researchers gave lectures and distributed leaflets and posters detailing information about the cropan’s boa, educating people about the importance of conservation of the snake’s natural ecosystem. The community was taught how to catch the snake alive, should they stumble across it. When the farmers spotted the snake in late January, they were able to recognize it and carefully capture it before contacting the researchers using the phone number on a poster that had been hung as part of the campaign. The snake was released into its natural habitat after being inspected and implanted with a radio tracker. It has already provided the researchers with new information. The snake was observed climbing to the top of a tree “with great dexterity,” suggesting Corpan’s boa spend a lot of time in trees, and not living on the ground as researchers had previously assumed.